Most of you, being an educated lot, will know that William Shakespeare has a ‘lost period’ just prior to when he wrote his first play (Henry VI part 1). For many years scholars have been uncertain as to his whereabouts, from roughly 1585 to 1592, and what he did to pass the time. It turns out he lived in Stornoway during that period and actually worked in a kipper shed on the Newton seafront. It is most likely that his Grannie (a Chrissie MacAulay from Uig) invited the young Shakespeare up to Stornoway (then a busy and thriving trading port) to avoid getting mixed up with ‘bad sorts’ down Stratford-upon-Avon way, what with their outrageous ruffs and pointy shoes. It’s also very likely that young William did voluntary stagehand work (and possibly some acting) in the ‘Ye Orbe‘, Stornoway’s only theatre at the time. Local historians have estimated that Ye Orbe would have been situated more or less where present day An Lanntair is now. The theatre of Shakespeare’s day would have provided entertainment in the form of short plays, performed most likely by the Stornoway Thespians (yes, they’re still going to this day), in Gaelic, English and french (for the posh people of Bayhead). These plays would have opened the imagination of the young Bard and would have filled his mind with all sorts of intricate plot lines, characterisations and bawdy verse. Inspired by the many tales of the Viking settlement of Lewis, the young William started work on his first play in 1586, known today as ‘The Stornoway Play’. The storyline involved the arrival of the first Vikings on Lewis, a cunning plot to cut down all the trees and build thousands of windmills (the corn milling kind) across the Barvas Moor in order to provide a ready supply of porridge, and eventually a plan to tow the island back to Norway which results in the break up of the island chain. The original manuscript was discovered recently in an old fish box (wrapped in a 1592 edition of the Stornoway Gazette) in the old stables behind the Lewis Hotel and is currently undergoing a modern day treatment by Theatre He-ho-ro. 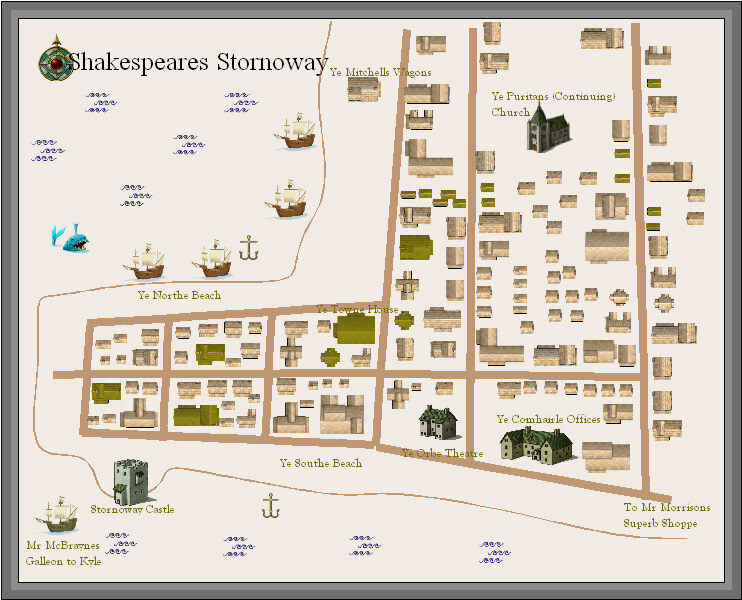 Alongside the manuscript was a dusty and worn map of Stornoway dating from around that time. It is thought that the map was made by well known explorer and map-maker Murdo Mercator (one of the Mercators of Lemreway) who was famed for mapping much of the known world (at that time the known world consisted of the east coast of Lewis as places like Uig hadn’t been discovered). Ye Orbe Theatre, more or less at the present day Kenneth St/South Beach junction where An Lanntair now is. the main church of the time, the Puritan Church (Continuing) up on Kenneth St. Used for many decades until one too many schisms led to a congregation of just two, resulting in this handful of ‘true believers’ sailing off to avoid religious persecution the new world (Scalpay) on a ship called the Mayfly. Mitchells Wagons, the main transport hub for the town, situated near the present day Lifeboat Building, where Mitchells Bus Station used to be.